Hiking is a mechanism used by human beings to convert food, water, and oxygen into distance and elevation gains (plus a bit of heat and CO2). Our goals atop the high peaks always require some amount of hiking. Safe and successful hiking atop the high peaks requires us to set a pace of exertion that we can sustain and to schedule enough time to safely complete the hike. Failing to set a sustainable pace means the chance of exhaustion or other problems that prematurely end our adventure. And failing to provide enough time means increasing weather risks that can tempt us to abandon our principles of safety. Hiking speed is a primary influence over which adventures we can do; it also determines when we need to start hiking and when we must turnaround to get safe. 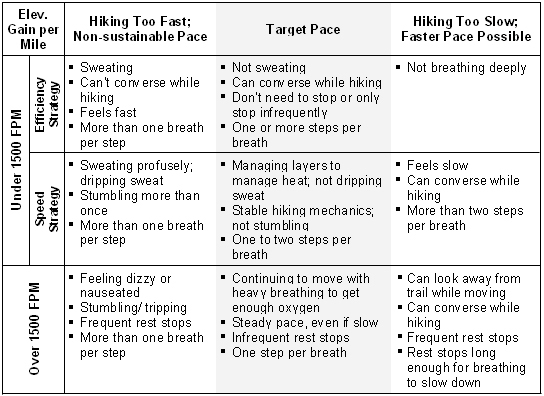 Since it is critical, we need to manage our hiking speed and the underlying pace of exertion in all three possible timeframes: (1) plan ahead of the hike (see Hiking Pace Planning essay) and (2) manage our pace during the hike to avoid problems, and (3) deal quickly and effectively with hiking problems that may arise on the hike. Once we are on the mountain, we have to deal with the reality of the trail. The Plan was as good as we could make it, but now we need to deal with the real life issues that affect our ability to maintain a selected hiking pace. We’ll need to manage our pace to accommodate the actual trail and weather conditions, e.g., rough, hot, and to match our personal physical and mental capability for that day, e.g., tired, not willing to work hard. And further, we’ll need to deal with physical or mental problems in our hiking as they may arise, e.g., blisters, boredom. We will modify our actual speed to accommodate the conditions we find along the way. Managing a pace on the trail has three components: (1) constant energy output, (2) use good mechanics & (3) use of milestones. First, we don’t hike according to any particular speed, but rather by output level. We go faster on the flat than we do the steep as we try to maintain a constant energy output rather than a constant speed. A constant energy output means our speed can vary considerably. 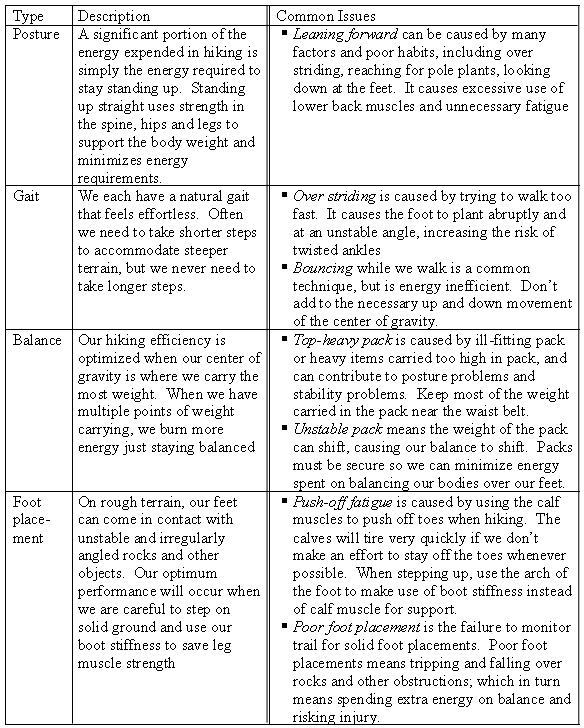 Second, we use good hiking mechanics to maximize speed & efficiency while minimizing risk of injury… a good combination. And third, we have to monitor our progress against the turnaround time by checking progress along the milestones versus the clock. We should time cushions in the plan to use to keep us from missing our goal due to hiking too slowly. But when hiking speed adjustments are necessary, the sooner we know the better. We manage the energy output by monitoring our breathing. Each of us has a different physiology and fitness, and so we need different amounts of oxygen for a given speed over a given terrain. But for each of us, the amount of oxygen we need is constant for a constant level of effort. A common approach used to manage pace is to take a constant number of steps per breath. The rate can change as the steepness and altitude change, for example two steps per breath on low angle terrain and one step per breath on high angle terrain. As we maintain a constant step to breath ratio, we maintain a constant energy output. For short-term changes in terrain (e.g., a hill), we can take shorter steps until the angle flattens out. If we need to breath faster than we step, we are probably hiking too quickly. If we do not need to breathe as fast as we hike, we are probably hiking too slowly. On adventures that require elevation gain as well as miles to hike, we can be tempted to seek out steep terrain to capture altitude in quick chunks. Unfortunately, at high altitudes we often find that the energy output requirements are so high and oxygen availability is so low that we just cannot go fast. On the other hand, the flatter terrain is easy but the elevation gains come slowly. For me, terrain that is 1000 feet of elevation gain per mile (approx. 10 degrees) is the most efficient for my body to gain distance and elevation (see FPH). The further away from that angle, the slower I can gain altitude for a given level of effort or energy output. On flatter terrain, I can hike faster, but the elevation will come more slowly due to the low angle of ascent. On steeper terrain, I can only hike very slowly and so the altitude gain is slower even though the terrain is very steep. Elite athletes find maximum elevation gain per hour at 15 degrees, so I use the range 10-15 degrees as the target range for maximum elevation gain efficiency. The key is to use terrain with this target angle of ascent and use switchbacks to lessen the angle of steeper terrain down to the 10-15 degrees range. To sustain a constant energy output for hours, we need to consume carbohydrates to help replenish the glycogen stores in our muscles and liver. It takes time to process the carbohydrates, so we should eat throughout the day rather than just one big meal. 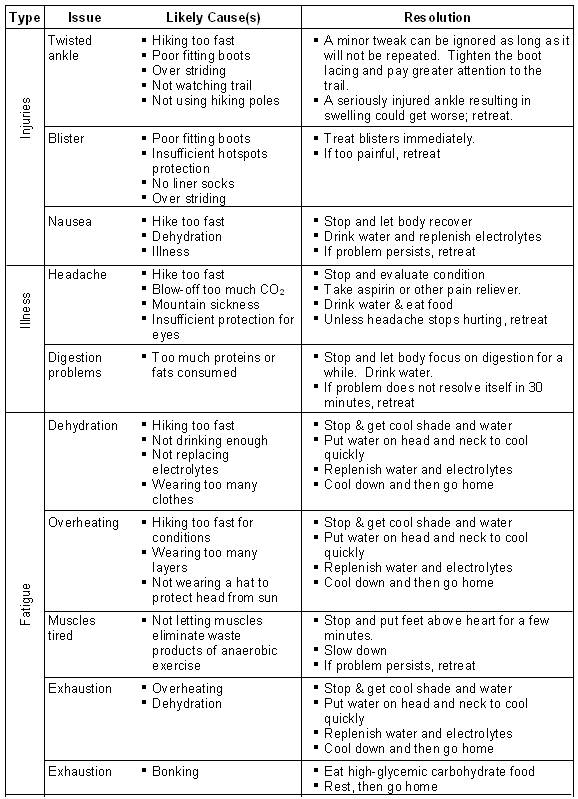 In addition, we need to replace the electrolytes lost to sweating in order to retain and use the water we replace. Combining the two necessities is a good idea. Eat ½ of an energy bar (or equivalent alternative) that contains sodium each hour to keep the machine fueled. We manage our time by tracking milestones. In a good plan, we establish milestones along the way so we can tell quickly if we are on schedule to reach our objective before our turnaround time. If we are behind schedule, we’ll need to make it up by hiking faster or reducing planned stops or by using time cushions added for just this purpose. If we are ahead of schedule, we should continue along to preserve our time cushions. To establish milestones, we use our knowledge of the route and our estimated hiking speed to estimate when we’ll reach key points along the route. There is considerable uncertainty in route knowledge, hiking speed, and absolute turnaround time, so we build in conservatism where possible. The uncertainty means that we’re never sure exactly how we are doing on time, but we assume that the plan perfectly certain until we have better information to use about our hiking pace, the weather and our ability to find the proper route. If we are late to reach a milestone (place along the route), we are so warned that we’re probably behind schedule for our objective as well. If we cannot recover the lost time, we may have to turnaround prior to achieving our goal. Milestones can include breaks. In planning for time, we should plan for rest breaks of 5 minutes every 30-60 minutes. This time should be used to rest the muscles, rehydrate and snack. These breaks can be done short or longer to accommodate conditions and shelter; just make sure the time is planned. Break time is for necessary activities first and conversation and relaxation second. Do not relax for 5 minutes and then hurriedly drink a bit of water without a snack. The 5 minutes will go quickly and the needed activity will require most of the available time. And don’t let a 5-minute break turn into a 10-minute break or we may find ourselves 30-60 minutes short of our goal at turnaround time. Someone should be in charge of the stopwatch. Be generous in planning for breaks and miserly when using them; if we need the time, be prepared to rest for a shorter time. We try as hard as we can to avoid hiking problems, as problems can only be dealt with by a retreat or suffering. To avoid problems, we plan ahead and manage ourselves carefully during a hike; but sometimes the problems find us anyway. Whether we have blisters, turned an ankle, or just feel tired, we need to deal with and resolve the issue so we can continue forward or get back to the trailhead safely. We are far better off avoiding problems than we are dealing with them. Eat a good breakfast and snack throughout the day. The mountains are a poor place for a diet. Start hydrated and drink throughout the day. Use layers to manage body temperature. Use good gear that fits. Use hiking poles and watch the hiking mechanics to avoid twisted ankles and other injuries. Each adventure has a unique set of variables affecting hiking pace and speed. On trips with short low angle hikes, cool weather, and plenty of available water on the trail, speed can be the emphasis. On trips with long steep hikes, warm weather, and no water available on the trail, efficiency must be the focus. But the key to safe success is not maximizing speed; it is maximizing predictability of speed. Minimizing our exposure to the weather is a part of safety. A fast hiking speed can do that for us, but at the cost of higher water needs, higher risk of injury, and a greater chance of tiring out too soon. An early start accomplishes the nearly same thing with a great reliability. Each of us needs to find our own comfortable pace of exertion and use it to understand what speed of hiking will result. Then we’ll be ready to predict our hiking time with precision over a variety of terrains. Until we know, just start early.